Marlie and Me: Don't Forget to Enter the Fall Fashionista Giveaways! Don't Forget to Enter the Fall Fashionista Giveaways! 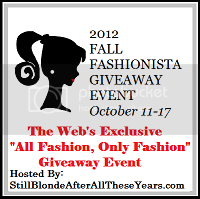 There is only ONE day left to enter the 2012 Fall Fashionista Giveaways! One more day to try your hand at winning more than $20,000 in Fashion prizes! Have you entered them all? If not, what are you waiting for? You don't want to miss the chance to win a $125 Macy's egift card from Midwestern Moms or the GRAND PRIZE Louis Vuitton handbag. And you definitely want to enter my giveaways. I have TWO prize packages for TWO winners! If you entered the mommy and me prize package already, come back and enter the college girl prize package too!